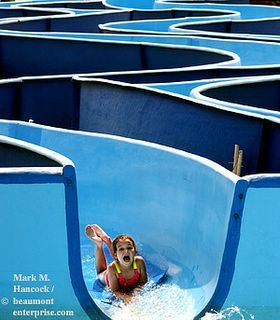 Maddie Thomas, 6, of Kountze screams as she slides toward the pool at Boomtown USA Waterpark in Vidor on Tuesday, May 31, 2005. Members of the Sons of Confederate Veterans Walter P. Lane Camp fire canon salutes during Memorial Day services at the Golden Triangle Veterans Memorial Park in Port Arthur on Monday, May 30, 2005. Memorial Day was originally called Decoration Day and was established as the date for the nation to place flowers upon the graves of the Civil War's dead. 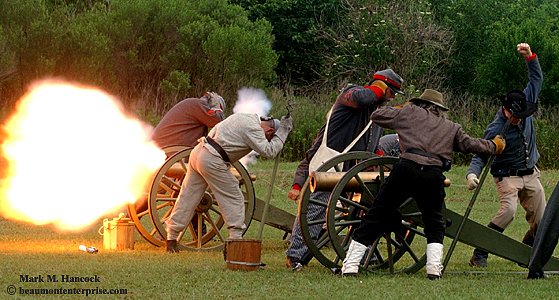 Fallen combatants from both the Union and Confederate sides were honored on this date. I honestly felt uncomfortable running this image. Race relations in Southeast Texas are not as good as I'd hope they should be. However, this was the most visual image of the day. Likewise, it harkens to the origin of Memorial Day. In most cities, this image would be seen as men playing historical dress-up and making big booms. Here, it looks less innocent. I'm still trying to figure out why things are this way here. Dallas' stratification is largely disbursed along the lines of income rather than reflectivity. It's also a city which isn't tied too strongly to history. If a building is in the way, it's torn down. If a racial barrier is in the way, it's torn down as well. My other blog has indicated one key factor: we can't cover what we don't know about. Since I'm new here, I'm not sure if I'm missing information or if there simply aren't cross-cultural activities (aside from the obvious Cinco de Mayo and MLK Day). I hope to learn the answer soon. If the Army taught me nothing else, I learned that everyone is green. We might be dark or light green, but we all bleed the same color red and have the same color tears. 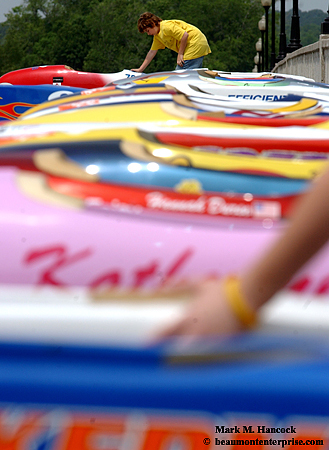 Please see this slideshow video of Memorial Weekend events in Southeast Texas during 2005. Delilah, Casey Arredondo Jr.'s 4-year-old Pomeranian mix, focuses on a statue titled "Man's Best Friend" before Memorial Day services at the Golden Triangle Veterans Memorial Park in Port Arthur on Monday, May 30, 2005. 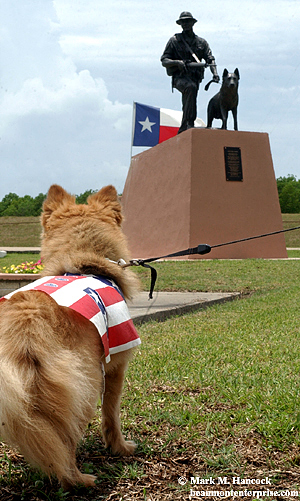 The statue is dedicated to the memory of the more than 30,000 military dogs who served during the 20th century. The statue completely freaked out this dog. She would not stop looking at it. I suppose it's a canine compliment to the artist. Deadline pop quiz: Where in the AP Stylebook can a journalist find the guidelines to write the name, personal pronouns and capitalization for dogs? 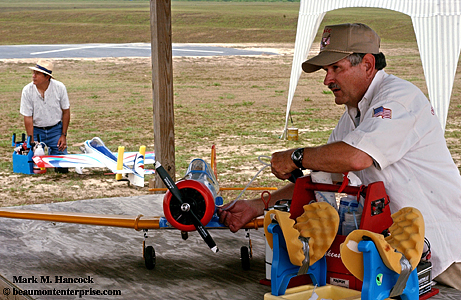 Terry Blankenship of Lumberton (right) works on his Navy SNJ trainer model while Robert Klahn (left) of Buna looks up from his U-Can-Do-3D during the Boys Haven RC Airshow at Finholt Field in Beaumont on Saturday, May 28, 2005. 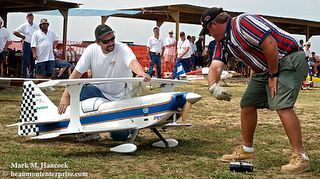 (Above) Rick Hallenbeck (left) holds a plane as Mike East (right) of Nederland starts the engine. (Left) Mike East of Nederland puts his 37 percent scale BME Ultimate biplane through its paces. 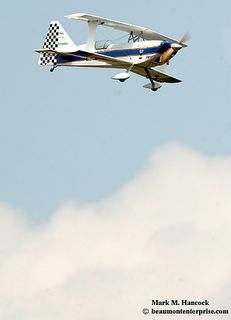 The show included participants from the Beaumont, Mid-County and Orange County remote control clubs. 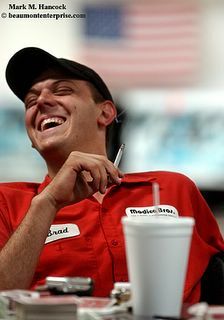 Brad Waugh has a smoke and a laugh with friends at the Park Central Bowling Center in Port Arthur on Wednesday, May 18, 2005. The center will go smoke free on May 26 to promote a family-friendly atmosphere. Smoking will still be allowed in the lounge area. Emergency workers investigate a fatal wreck near the intersection of Highways 62 and 105 in Orange County on Tuesday, May 24, 2005. 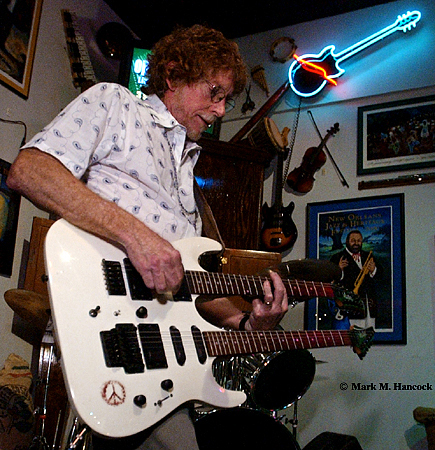 Pete Churton plays guitar during a Buffalo Blonde concert at the Logon C@fe in Beaumont on Saturday, May 14, 2005. 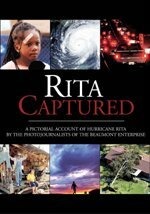 Over the years, I've heard some horror stories about photo departments at other newspapers. I always felt lucky to have avoided similar situations. Tonight, I'd like to introduce y'all to the Assistant Managing Editor (A.M.E.). His name is Pete Churton. He believes in photojournalistic integrity and trusts my vision. 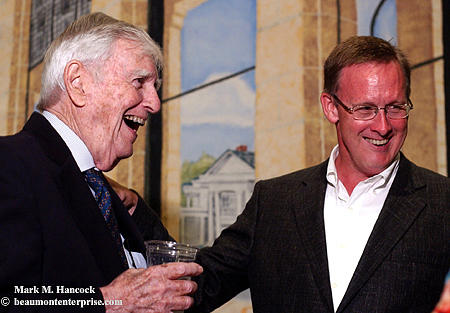 He's been a PJ at The Beaumont Enterprise for the last 28 years. He loves it here and doesn't intend to leave. He also plays lead guitar and secondary vocals in a rock and roll band called Buffalo Blonde. This weekend, he had a pool party at his home. It ended with an acoustic jam session under pine and palm trees of his large backyard. Lamar's Michael Ambort (No. 33, right) slides safely across the plate as Texas State's David Bednarek (No. 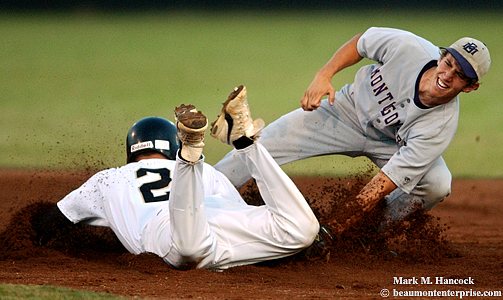 30, left) moves for the tag during a baseball game at Lamar University in Beaumont on Saturday, May 21, 2005. Lamar's Collin Delome (No. 24, right) makes it safely back to first base before the pick-off attempt of Texas State's Cody Ross (No. 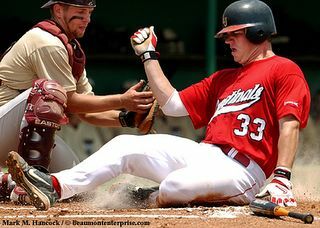 29, left) during a baseball game at Lamar University in Beaumont on Friday, May 20, 2005. West Brook's Mark Serna (No. 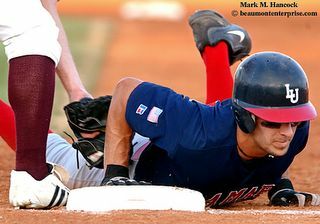 7, right) slides across the plate as Humbles Rob Vaughn (No. 11, left) tries to handle a throw during a Class 5A Regional Quarter Final baseball game at West Brook High School in Beaumont on Friday, May 20, 2005. I hate the background on this image, but the action is good. I actually got a higher than normal set of plate shots during the three innings at this game (I had another game at Lamar University across town). 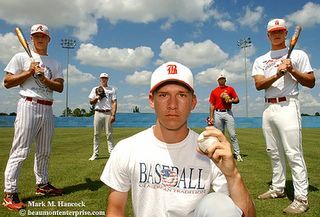 West Brook High School baseball team seniors (from left to right) James Ewing, Jay Bruce, Brandon Castolenia, Pat Ford and Michael Ewing pose for a portrait at Bruins Field in Beaumont on Wednesday, May 18, 2005. They play a series against Humble for the 5A regional quarterfinals starting on Thursday. The five have played for the varsity team since they were freshmen. They all graduate on Saturday. There are certain universal facts in this world: The sun will rise in the east and set in the west, everyone eventually dies, and each daily newspaper needs sportraits (Sports portraits). Most people think of high-action images when they think of becoming a Sports PJ. However, sportraits are equally important because of how sports are reported. Why do we need sportraits? Sports is about numbers. Sports reporters present a set of numbers after each game. The numbers describe the game in a comparative manner. Likewise, players of most sports track their numbers throughout their athletic career. Baseball players know their batting average. Football players know their rushing yards or sack totals. Swimmers and track athletes know their fastest times per event. High-level chess players know how many moves were made to get a win. Chess? Yes, it's a sport because it involves numbers and a winner/loser equation. Wait, the Business page is about numbers. How could Sports be the same? Because both Sports and Business involve money. If it has a numerical conclusion, people can place wagers (or sell short) against the numerical outcome. Chess, for instance, can have odds against the winner or loser based on the players' previous experiences. Odds can also be placed against the number of moves required to win. Obviously, if 50,000 people each bet one dollar on an infinite number of moves, someone will win big by foretelling the exact number of moves (or the house keeps it all). Since we've determined Sports is mainly regulated by numbers and the human ability to achieve certain numeric milestones or limits, we realize these numbers don't make great visual content. In the image above, five baseball players have been on the varsity team for four years each. These are the numbers which separate these players from the other players and break up the team to a reasonable number for the reporter. The numbers are the story peg. Of these five players, one is a pitcher, one is a catcher, one is the shortstop and two are in the outfield. What are the odds of getting all five in one frame during a specific game? Unlikely to impossible would be my guess. To accompany a strictly numerical story, photojournalists must round up the various people who represent a given set of numbers and somehow make it look cool and give the readers faces to equate to the numbers. Often, it's the only time most readers see their faces (because of helmets). For many businesses (including various media), sports are the road to profit. Likewise, huge industries exist to perpetuate this revenue-producing trend. Uniform and equipment manufacturers, athletic trainers, kinesiologists, insurance companies, CPAs, and countless advertisers of beer, chips, etc... all have a vested interest in sports reportage. Additionally, we've already discussed the potential income for professional gamblers as well as the casinos and various other book keepers. Because of the general business environment, sports are doubly important to publishers. The Sports section not only generates advertising income from related businesses, it also generates circulation from all the parents of young athletes, who have a keen interest in becoming a future hometown hero. Newspapers cover local high school sports more completely than any other media outlet. Magazines tend to cover collegiate and professional or specialize into specific niche sports. Local television might report the final scores as a list accompanied with 10-second clips from the top two or three games - at a specific time. Because newspaper publishers value the Sports department and PJs who can deliver compelling images for this department, it's the best opening for young PJs. More importantly, it's regular business for freelancers. Each Tuesday and Friday during the school year, there is something to shoot. Additionally, Sports is a daily section. They must fill the space with feature stories in advance of upcoming sporting events or because of significant milestones. Most of these stories are about numbers. Sportraits break up the gray on the page and fill the dead spots in a freelancer's schedule. PJs who know how to shoot various sports as well as make interesting portraits of the players have a much easier time getting initial freelance assignments. Every newspaper in America needs sports PJs for Friday night football in the fall, basketball and soccer in the winter and track, softball and baseball in the spring. Although staff photographers can handle most of the Sports assignments, during peak times, freelancers are required (or at least hired) at most daily newspapers to get wider coverage and make more readers happy. The freelancers who can embed themselves into the Sports department are most likely to get sportrait assignments as well. From there, it's not a big leap to understand that anyone who can catch a guy flying through mid-air at night can handle breaking news. Nor is it difficult to understand how a PJ who's good at sportraits could apply the same skills and knowledge to any other group of people (business, news, lifestyles, etc...). Sports PJs who can light an entire arena should be able to handle most studio assignments as well. Consequently, any PJs (including part-time and high school PJs) who are trying to break into the industry might want to look at breaking into Sports first. Sports PJs must know how to handle fast action in low light situations as well as how to make interesting sportraits. From there, the rest is easy. 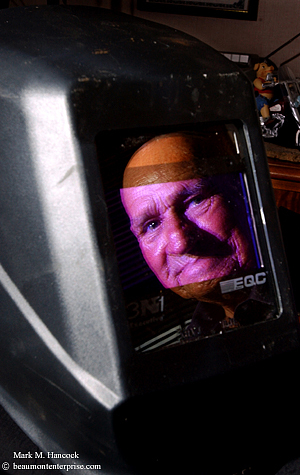 Lilton Sonnier, president of Winnie Welding Works & Construction, Inc., reflects off a welder's mask as he poses for a portrait at the company in Winnie on Thursday, May 19, 2005. The company won the Torch Awards for Marketplace Ethics. Nederland's Jordan Rash (No. 2, left) slides safely to second base past Montgomery's Seth Hill (No. 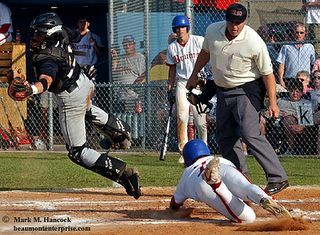 19, right) during a Regional Quarter Final baseball game in Nederland on Thursday, May 19, 2005. Command Sgt. 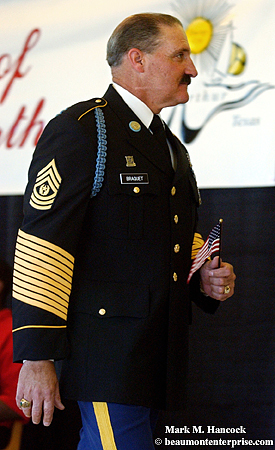 Maj. Dana Braquet proudly carries a souvenir American Flag to the "Salute to Our Port Arthur and Area Heroes and Heroines" at the Robert A. Bowers Civic Center in Port Arthur on Tuesday, May 17, 2005. The event honored Southeast Texas veterans and the families of soldiers who are currently serving in the military. Deadline pop quiz: Where in the AP Stylebook can a journalist find the correct way to write the ranks of all soldiers, sailors and airmen? Bonus questions: At a minimum, how many years has this man been in the military? What is his military occupational specialty? Answers are in the comment section. 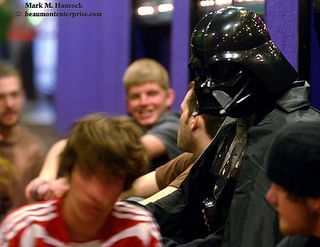 (Above) Darth Vader (Trey Little, 17, of Beaumont) waits in line for the opening of the newest movie in the Star Wars saga at Tinseltown theater in Beaumont on Wednesday, May 17, 2005. 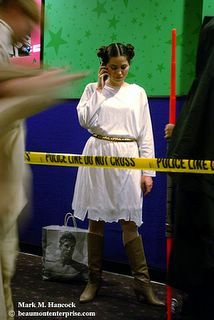 (Left) Princess Leia Organa (Jamie Dolezal, 17, of Orange) talks on a cell phone as she waits to see "Star Wars: Episode III -- Revenge of the Sith" at Tinseltown theater. "Star Wars: Episode III -- Revenge of the Sith" grossed $50,013,859 from showings at 3,661 theaters. It broke the record for single-day movie sales. 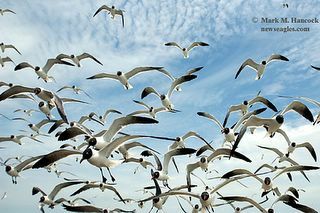 Gulls fly behind the Texas Department of Transportation ferry above Galveston Bay near Galveston on Monday, May 16, 2005. Fay and I took a 90-minute day-trip to Galveston. She posted a large set of Moody Garden Aquarium images on her break room site. This illustration contains six different individual frames of Jamaal Charles. He's an outstanding athlete with great potential. I photographed him two weeks ago when he beat the No. 1 and No. 3 nationally-ranked hurdlers during the Region III Track and Field Championship meet in Humble (near Houston). This weekend, he won the state 5A championship. As you might guess, this image created a little buzz at the office. Mostly the questions were about how it was done. I'll explain why it was done, then I'll explain how. But first, let's discuss the role of ethics in photojournalism as it applies to digital manipulation of images. I believe all digitally manipulated images should have the designation "Photo Illustration" to differentiate them from photojournalism. Moving image elements (pixels) without disclosure is the visual equivalent of a lie. It's contrary to photojournalism, which aims to show the truth. Although there are times when a photo illustration is appropriate, it's best to avoid them and use them only when there is no better way to tell the story. This assignment was designated as "hot," meaning they needed it quickly for the next day's newspaper. The story idea was to explain the stride and steps a champion hurdler takes from one hurdle to the next. I could have shot it as a straight sequence to show the stride and distance. However, the track configuration at the time of the shoot would have placed the hurdler's face in shadow instead of light. His skin tone was not reflective enough to handle the two-stop difference. Additionally, a straight sequence would take more space than needed and still wouldn't accomplish the explanation. 1. Shoot whatever he did during his normal practice, have his face be lost in the shadow, and possibly not get what I needed anyway - not a good option. 2. Fake the scene (subject manipulation) and have him run into the light several times until I had a good sequence - an IMPOSSIBLE option for my ethics. 3. Make an illustration where I had exactly what I needed while fully disclosing the situation as an illustration with subject and digital manipulation. Consequently, I committed to a photo illustration to keep on ethical high ground. To shoot an illustration, the PJ must previsualize the final image. This means the PJ considers the various obstacles and understands what elements are required to accomplish the desired final image. It also makes the PJ consider camera angles, light, background elements and other factors, which could weaken the final image. For this image, I knew the hurdler must run into the sunlight to have facial details. I also knew I needed enough room to back up and shoot it flat with a longer lens. Furthermore, the background needed to be neutral rather than the high key (which the visitor's stands would have created). The only area of the track which accomplished the majority of these needs also contained the shadow of one of the light poles. In a perfect world, we would have waited for the shadow to pass from the hurdling area, but we were on a tight timetable. Ideally, I would've gotten a ladder to use the football field turf as a background, but this was a last-minute decision and no ladder was available. We did what we could with what was available. Sometimes it's how news PJs must do things. This image required me to "shoot it flat." Flat sequences are different than panoramas because the camera moves as well as the subject. In a traditional panorama, the camera is stationary while the subject is either stationary or moving. A panorama thereby creates a curved distortion caused by changing camera angles. I have an admittedly rough example here. Because it was for an illustration, I asked the athlete to run the hurdles four times. I included most step sequences from one hurdle to the next to show the distance traveled, the stride and the number of steps involved. The second step is missing because it would have crowded three images into an already tight portion of the image. The images were shot with a 200mm lens from three different locations along a fixed path (two frames per position). This set the background at the appropriate angle. I can't overemphasize the importance of shooting the right image angles to create the final image. The remaining steps are done in PhotoShop. When processing the images, it's best to handle the whole batch in its original files before color correction. Then, the color corrections are consistent throughout the whole image. First, open the base image in PhotoShop. This sets the image to the extreme right or left of the final image. I chose the right-hand image because he was running to the left. Next, choose Image and then Canvas Size. A pop up window appears. Choose the Anchor quadrant from the 10 options to set the base location. Then increase the height or width to slightly more than expected for the final image's size. Then choose OK. This increases the canvas size to the new dimensions and includes the base image. Throughout the process, much of the computer's random access memory (RAM) is used. The likelihood of a computer crash is good. Consequently, folks should Save their work after each completed step. This creates much less stress when the computer does eventually crash. Once layers are introduced in the next step, the image suffix converts from a .jpg (joint photographic expert group) to .psd (PhotoShop Document). The file size also dramatically increases. The advantage of this change is the image doesn't lose information on each additional Save. The .jpg protocol compresses the file upon each Save and ultimately degrades the image. However, once the image is completely assembled, it's best to Flatten the layers and Save the final document as a .jpg image to compress the overall image for storage. Anytime more than one image, text or graphic element is introduced into a PhotoShop image, a new Layer is created. On extremely complex images, it's best to choose Layer and Flatten Image at each major project point to cut down the size of the total PhotoShop image. While working with layers, it's possible to become confused because all layers appear simultaneously as a two-dimensional image on the screen. To distinguish between layers, choose Window and then Layers to see the set of options. As each layer is chosen from the list, it moves forward in the master image. This doesn't mean it appeared this way when flattened. It only designates which layer is currently active. After several attempts, it becomes easier to learn the layering patterns and how to use them appropriately without confusion. Next, open the second image in the series. Select all and copy the image. Paste the image onto the original image. It should appear in the middle of the canvas. Use the Movement tool (on the toolbar it looks like arrows pointing in four directions) to set the image where it belongs according to all image elements. If the image is "simple," the image elements align near the edges with a slight overlap to allow placement. If the image is complex - such as this one - locate guide points (landmarks) within the image to determine what must be covered or revealed in either the forward or back image layers. Once the guide points are determined, choose Window and History and delete everything from the last Paste command. Save. Now it gets tricky to decide whether to layer the top image over the bottom, the bottom over the top or a combination of both. Often the primary subject and background determine needs. This option keeps image elements from the existing file in front of newly introduced images. Using the Lasso tool, select the area to remain forward in the original image. Then, select the remainder of the original image area(s) to keep. The remaining portion of the image(s) could be overwritten (depends on the incoming image). Because the selected area is the area we want to protect, we must choose Select and then Inverse. This actually chooses all remaining portions of the image and canvas. Now, choose Edit and Paste Into options to place the new image or graphic element. It must be moved into position, but it slides behind the originally selected areas. This option selectively places image elements over the existing file. On the image to be introduced to the master file, use the lasso tool to select areas to be introduced to the master file. With this illustration, I selected the whole image and subtracted the areas I didn't want to overwrite. The same effect is accomplished either way. Once the area is selected, Copy the area. Change back to the master image and Paste the copied area. Move it into position. The copied area has the shape selected in the first image. It moves over the existing image(s) and becomes the top layer. Continue the copy and pasting process until the images fill the blank canvas area. If additional canvas is needed, simply increase the canvas size in the required direction(s). Once all the pieces are assembled into the master document, Flatten the image. Save the image. It'll probably have a ragged edge. 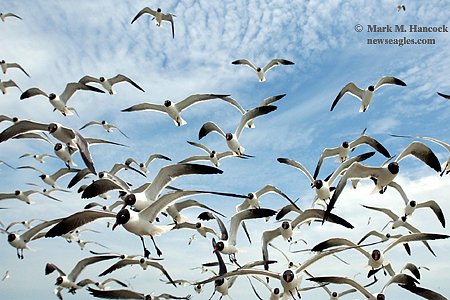 Use the Crop tool and crop off the ragged edges to make the image appear complete. Then color correct, sharpen and adjust as needed. Once the image is absolutely completed, convert it to a .jpg and Save the final image for storage. 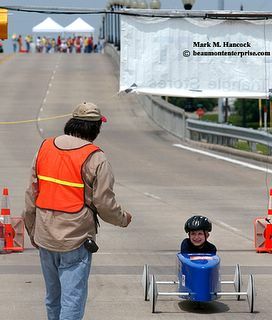 (Above) Katherine Davis, 9, zooms down the raceway during a practice session for next week's Soap Box Derby on Maury Meyers Bridge in Beaumont on Saturday, May 14, 2005. 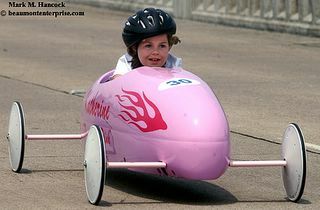 (Right) Rico Vasquez, 12, (top) prepares his car during a practice session. 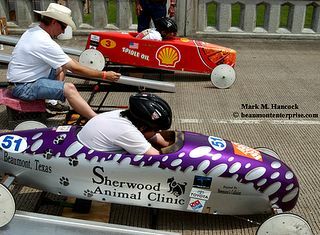 (Above) James Rule (left) with YMBL releases the derby cars of Jake Warner, 10, (top) and Walt Spidle, 11, (bottom). (Left) Raymond Cerda (left) with YMBL tells Matt Guy, 8, (right) to apply his brake after he crosses the finish line. >(Above) Sgt. B.J. Murphy (right) gives his son Hunter, 7 months, (left) a kiss after the company was released at the National Guard Armory in Beaumont on Saturday, May 14, 2005. Meghan Murphy (background) went to Georgia with her husband and gave birth to Hunter there. 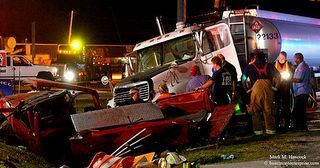 Award of Excellence, General News photo, The Society for Newspaper Design. 3rd place, News photo, Hearst Honors May clip contest. Sgt. 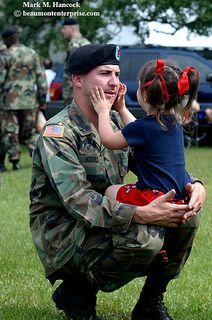 Jeremy Hodges (left) reunites with his daughter Emily Hodges, 3, (right) after a company debriefing. Alpha Company of the 1/133rd Military Police Provision returned after serving 16 months at Fort Stewart, Ga. while the host company was deployed to Iraq. Sgt. B.J. 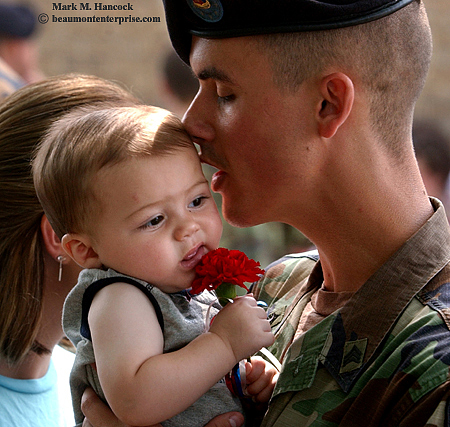 Murphy (right) gives his son Hunter, 7 months, (left) a kiss after the company was released at the National Guard Armory in Beaumont on Saturday, May 14, 2005. Meghan Murphy (background) went to Georgia with her husband and gave birth to Hunter there. Last time, we considered where job openings are posted. If some folks browsed the options, they might be understandably confused about which jobs to apply to and what the next step might be. Now is when a job hunter must do some research. The first questions a job hunter needs answered are simple. We need to know the circulation size and frequency of the newspaper to compare it against what we already know. Often, these answers tell us how well suited we are to compete for the job. If the job is at the same-sized newspaper with the same publishing frequency, there shouldn't be any problem (other than institutional culture variances). We'll cover this in more detail later, but lets let the big kids, who've played this game a while, get to their new jobs now. Below are some resources to help job hunters research potential employers. These resources allow applicants to find circulations critical to initial job applicants. Frequently, circulations won't be included in job postings either to allow for a larger pool of applicants or to keep the flood gates from opening. I'll include this caveat, circulation isn't the holy grail. Many smaller papers consistently provide more space and run better images than some of the gigantic metros. But, it's still good to know approximately what kind of resources a PJ could expect at a new job. A good starting place is paper's own Web site. Most newspaper Web sites will have an "about us" or "contact us" section. These areas will often list circulation, a organizational structure, parent companies as well as a little about the area (this is normally on a "working at the ___" page). Gebbie Press is a resource for PR professionals to approach media. It's also a good resource for PJs to find Web sites of prospective newspapers. It lists links to most daily and weekly newspapers as well as state press associations, magazines and TV stations (under "Media Links" on the top navigation bar). Newspaper Diversity contains detailed reports for the Knight Foundation on more than 1,400 American newspapers and their circulation areas. It is primarily used for cultural diversity comparisons. However, it's an excellent way to get useful information about traditional newspapers' approximate circulation, ownership and a comparative ranking against other newspapers. It also lists and ranks the top 200 newspapers by circulation at the time of the last foundation audit (this distinction is good for comparison against more current audits). Audit Bureau of Circulation (ABC) contains the audited circulations (raw data) of most newspapers. It also contains information about magazines, business publications and farm publications elsewhere on the site. It is the first and largest non-profit auditor of newspapers in the world. Advertising rates are frequently established or corrected by the data this organization acquires. Because it's the most up-to-date public repository of circulation information, the numbers can be compared against Knight Foundation numbers to quickly establish growth or decline trends. The numbers can be overwhelming, but it also gives an apples-to-apples comparison of similar-sized publications. 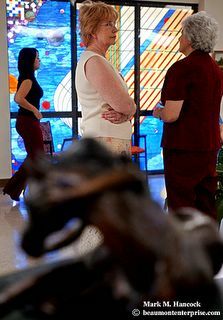 Rachel Turner with Joe Arnold Consultants (from left to right), board members Carolyn Hancock and Alice Windle wait for the unveiling of the Texas Artists Museum in Port Arthur on Tuesday, May 10, 2005. The museum has undergone several changes including a name change. Although this shot isn't stellar, the assignment was to shoot a press release event where the museum's new name would be announced. In other words, the paper expected a podium shot. I think the desk was relieved when I returned with this image instead of a talking head against a white wall. Since he's probably going to kick most of our butts this year, take a moment to look at Michael Yon's blog. He's doing a great job blogging from Iraq. His comment section is limited to "team members," otherwise I'd ask pro PJs to give him a little support. I think he'd appreciate it. Michael sent me a nice note today. It was kind of him to take time away from staying alive to drop me a note. He wants to know about the D2X. I know about the D2H, but not the X. If anyone could send him a personal review of the D2X, he'd appreciate it. Please approach the following markets only if completely prepared. This means PJs already have a solid portfolio on CD and online, proper stationary, a perfected resume, cover letter and thank you notices, a way to track correspondence and a willingness and/or need to move (expect permanently) to a new location with new challenges. If all these criteria are met, below is the daily hunting list for PJ jobs. There are additional navigation tips at the bottom of this post. Sites are listed in the order most likely to have PJ openings. Must be an NPPA member to use the JIB. Many of the premium jobs are ONLY listed here to eliminate unqualified applicants. This is the primary source for human resources postings (it means someone other than the photo department handles hiring). Magazine market looking primarily for photo editors with experience. Hearst careers Hearst properties typically handle employment independently. High-level professors wanted for major universities. Masters, doctorial degrees and/or significant awards needed before applying. Folks entering the profession as well as experienced PJs with multiple skills should include www.craigslist.org in daily job searches. Since budgets have been slashed, many large companies look for tech-savvy professionals on Craigs List. PJs with the most diverse skills will find it most useful. Otherwise, it's a location to pick up a freelance gig or two to pay the bills. 1. Be patient. A search for a good PJ job takes six months to a year. 2. Only apply to jobs you want. 3. Don't pay to have a resume posted online or through some other service. 4. Learn where the search section of each job bank is and type in "photo" with few other restrictions to get the highest number of potential jobs. 5. Know where you've been and where you're going (pay, circulation and skills). Apply to jobs which are one step above your experience level. 6. It's easier to find a job if you already have a job in the field. 7. Understand some employers only hire from the local region. 8. Understand some employers can't afford everyone they want and might not even ask how much you want because they think your price will be too much (nobody likes rejection). 9. A pre-screen isn't a job guarantee. 10. Until a negotiation is settled, all options remain possible. 11. Don't send portfolios via expensive, faster routes (Overnight Express, Priority Mail, etc...) unless the employer specifically asks for it. 12. Although low-level, low-pay jobs are available through word-of-mouth and friendly e-mails, the good jobs are always posted somewhere legitimate to get the widest possible pool of talent. 13. Don't forget to check the state press associations for jobs in states of interest. Between the new job, new blog, keeping The Princess happy and generally adjusting to life in Beaumont, I haven't posted much lately about photojournalism. Sorry. Part of the problem is the scale of what I want to discuss next. My plans are to write how-to posts for soccer, baseball, softball and track; some elementary discussions about composition; a large series on how to get or change a PJ job; and a major series on the biz side of this game. Rather than fretting about what I must do, I'll start cutting through this material, and we'll sew it all together later. The next post lists the daily hunting list for serious PJs looking for full-time employment. The links cover newspapers, magazines and academia. If this is the first time a PJ approaches the pro market, it's good advice to hold off the mass-assault until I finish this series. By the time we're done, we'll discuss specifics about portfolios, cover letters, tracking applications, thank you letters, interviews and job negotiations. For now, simply take a look through the links and see what the market looks like and how it is evolving. Pat Thompson poses for a portrait at her home in Port Neches on Friday, May 20, 2005. 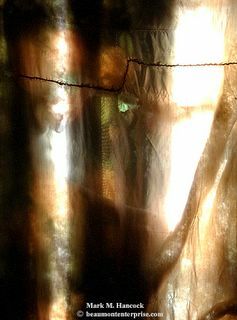 To her, the light shining through a blanket over her window shows the image of Jesus. She first saw the image on May 16 about four hours before her son was in a car wreck. 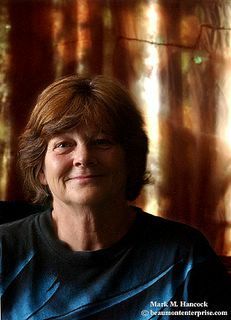 Her daughter died in an car accident on May 8, 1997. She thinks it could have been a message that her son would be OK. He lived through the accident. Although she's not certain when she got the blanket, she thinks it was a gift from her daughter (before her death) because she cared enough to repair it when it had become torn. Before anyone freaks about the image contained within the blanket, understand it required a 30-second exposure and some very delicate lighting to make it work. Please read the related story if interested. 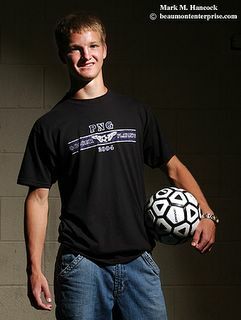 Tim Zimmerman, a junior at Port Neches-Groves High School, poses for a portrait at the high school on Wednesday, May 7, 2005. Zimmerman was named by The Beaumont Enterprise to the Super Gold Soccer Team. This is the matching boys photo to this image. As I said in the comments of the other image, the pose wouldn't have worked for him. 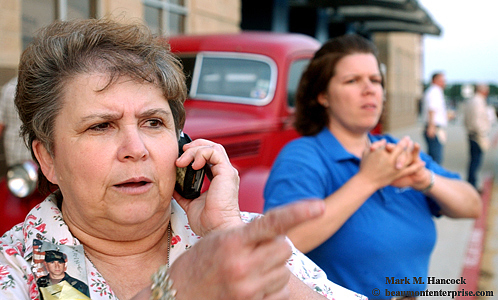 Lynn Billiot (left) gives her son driving directions while her daughter Dustye Billiott (right) nervously awaits a family reunion at Ford Park in Beaumont on Saturday, May 7, 2005. 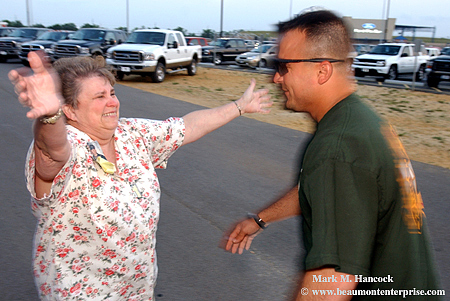 Lynn Billiot runs into the arms of her son Sgt. Danny Billiott near the Ford Arena in Beaumont on Saturday, May 7, 2005. Sgt. Billiott has been serving in Iraq since September of 2004, his homecoming made Billiot's Mother's Day complete after losing a grandson and daughter within the last year. Note: Lynn Billiot spelled her children's names with two "t"s (Billiott) after she noticed the spelling on a family member's gravestone. (Above) Jeremy Faas (No. 76, left) of Needville, Texas has a near collision with Wayne Barber (No. 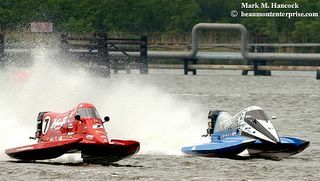 0, right) of Port Neches during the "Thunder on the Neches" super stock tri hull races at RiverFest in Port Neches on Saturday, May 7, 2005. (Below) Nathan Worthy (No. 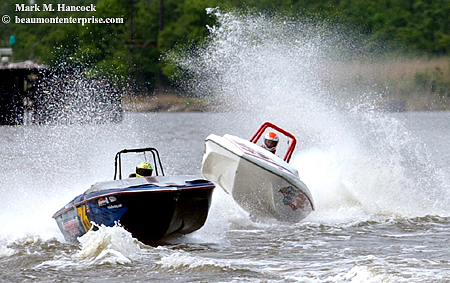 7, left) tries to hold a lead during the "Thunder on the Neches" SST 120 class tunnel boat races. (The other boat was not listed in the heat sheets). Former mayor James D. McNicholas has a laugh with Guy Goodson during an election party at Katharine & Company in Beaumont on Saturday, May 7, 2005. Goodson won the election and got some sun. 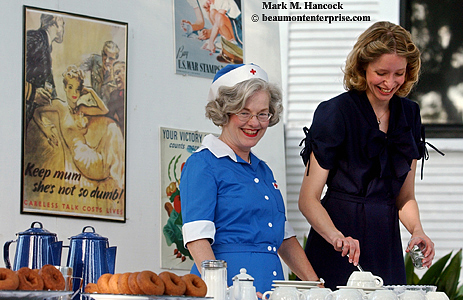 Linda Cummings (left) and Amber King (right) serve drinks and doughnuts during the 1940s Porch Dance at the McFaddin-Ward House in Beaumont on Friday, May 6, 2005. A water snake lets a damselfly hitch a ride at Anahuac National Wildlife Refuge in Anahuac on Tuesday, May 3, 2005. The refuge will dedicate a new Butterfly and Hummingbird Habitat as well as the Willows Trail during a ceremony on Saturday, May 7 at 10 a.m. Since I like trivia (and snakes), I learned how to tell a water snake from a poisonous water moccasin (also known as a cottonmouth). Water snakes have round pupils. Water moccasins have slitted pupils like a cat. 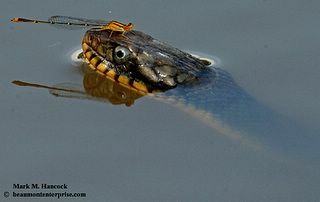 The body of a water snake sinks into the water. The body of a water moccasin floats atop the water. So, before anyone freaks at a snake in the water, apply these tests. If it floats and has cat's eyes, ummm... dude, you're in trouble.